Are you ready to discover the undiscovered? Are you ready to climb the tallest mountains, wear the finest clothes, and earn a fortune beyond compare? Then welcome to the New World! 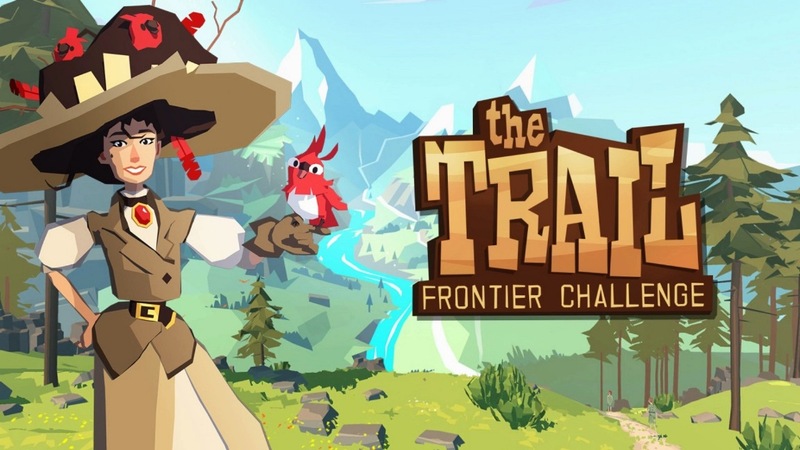 Developed by 22cans, the development house of famed (and notorious) game designer Peter Monyneux, The Trail: Frontier Challenge was first released as a mobile title in 2016 as The Trail: A Frontier Journey. It was later made available to play on PC as an updated port, and now that port has made its way over to the Nintendo Switch. If The Trail: Frontier Challenge was bolstered by Molyneux’s outlandishly enthusiastic descriptions of games under development like many of his previous titles, it’s possible we would be disappointed. Thankfully, what we have is a rather charming adventure that accomplishes what it sets out to do, for the most part, successfully. The story centers around you starting off as a pioneer in a New World walking a vast trail to find the town Eden Falls, which is supposedly a rich center for social and economical opportunities. Players begin their journey on the shores of the New World with nothing more than the ragged clothes on their back and a list of tasks to perform: settle in a new town, take on a profession, raise a family, make a fortune. The Trail: FC is a game full of large goals to accomplish, but also enjoying the small steps to get there. While walking the trail there will be many different types of areas; from large wooded areas snowy mountains, The Trail: FC has a visually pleasing world that is further enhanced thanks to its unique art style. Every character and animal you encounter is unique and while The Trail: FC may seem uniformed by traveling a predetermined route, I never felt that I was walking the same path. Because of this, I was eager to see what would happen at the end of my journey. The Trail: FC also features some nice, soothing music while adventuring and although it was repetitive, I found that it added a calm ambience to the title. During my playtime, I never felt rushed and had no trouble absorbing the environment. Accompanying you on the journey is the helpful NPC Beatrice and her adorable bird Koko, who travel with you and give you objectives to perform, from possibly collecting a certain amount of an item or hunting a specific animal. Saying that your journey is a long one is an understatement, as you will be taking many steps as you walk down the dirt path from the dock where you land to, eventually, the town you will settle in and beyond. The main gameplay centers around simply walking, which your character will do automatically according to the speed you’ve dictated. As he or she walks you’ll be able to control the camera and look around in search of resources scattered around the environments you’ll cross. You can collect these resources—such as apples, twigs, rabbit fur, wood, rock, etc.—by simply looking in its direction, highlighting the item, and then pressing the ZR button. The items you pick up are used to craft new items or to gain currency by trading. This is vital for survival as your character’s stamina meter is always draining when walking the trail and goes down slower or faster depending on the amount of items in your pack, which can be updated. If your stamina meter completely depletes, your character faints and all your items will be lost. During my time, there will supposedly be a way for other online explorers to take your items after passing out, although I wasn’t able to see this feature come to fruition being that I’m playing the title before it has been released to the public. You will also be able to trade and buy/sell items with other adventurers, which I was able to do with AI controlled NPC’s at campsites. Speaking of camps, they act as places to rest and save points between walks, allowing you to recharge your health and craft items from your pick-ups before continuing on the next leg of your journey. The items you can craft range from clothing that will improve your attributes like stamina and walking speed to rare artifacts that are only used to earn extra cash. Camps also let you trade with other players or NPC’s through a mini-game where everyone places their sale items on a conveyor belt and snag what they want before it’s fed into a wood chipper, provided they have the money of course. This is a good way to get anything you didn’t find along your walk, like a piece of wood to fashion a new slingshot, or to lighten your own load by selling off all the items you don’t need. Unfortunately, this is the bulk of the gameplay which can become repetitive over longer sessions. Technically, the framerate and graphics occasionally took a hit with stuttering when loading new areas or just opening your backpack and in some instances hindered my enjoyment. The controls also can feel unintuitive at times, mainly from what I believe is porting most of the game over from a mobile platform. Overall, The Trail: Frontier Challenge is a rather pleasant and subdued adventure that scratches the itch for having a progressive system with an enticing premise. The different types of environments you encounter and the gameplay elements of traveling, collecting items, and crafting combine into a fluid path forward with a constant sense of progress even if you choose to retread past areas. Even with repetitive gameplay, some grinding, and occasional performance issues; The Trail: FC premise alone is worth checking out if you just want a casual gaming experience on the Switch. Thanks! I never experienced disappearing items, but there were some hitches in the framerate. I never had items explode from my pack either and I bet that was quite the experience! Trying to fit everything in the bag was sometimes annoying due to items just falling out if it was overstuffed, but fortunately they always returned until I made room. Good review, sums it up pretty well. Allthough I’m a bit disappointed by the game’s amount of frequent bugs. Being it the sudden disappearance of items or the fact that I can no longer access my chests. My crafted upgrade items are now forever stuck in the chests. Sometimes items from the backpack will even make a random leap of faith and explode out of the backpack for no apparent reason.